Former acting Attorney General Sally Yates, who was fired by the Trump administration in January after refusing to defend the first travel ban, appeared in a hotly anticipated Senate Judiciary Subcommittee hearing on Russian interference Monday afternoon along with former CIA director James Clapper. 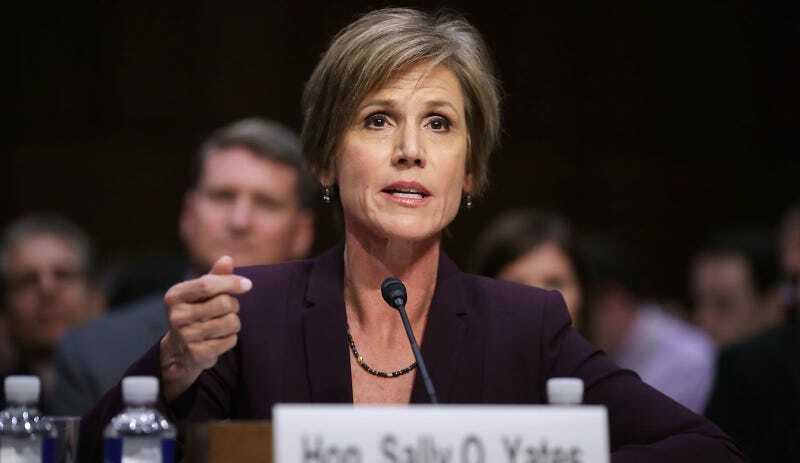 During the hearing, Yates swatted down a number of stupid questions from Republican senators with the calm, drawling precision of an Italian swordmaster. In her opening remarks, Yates warned that “many of the topics of interest today concern classified information that I cannot address in this public setting, either directly or indirectly,” and during the hearing, as in other hearings held recently on Russian interference, both she and Clapper declined to answer or give detailed answers to a number of questions. However, during the hearing Yates revealed that she had two sit-downs and two phone calls with White House Counsel Donald McGahn to discuss Michael Flynn, informing them that Flynn was susceptible to Russian blackmail because he’d lied to Vice President Pence about his contact with the Russian ambassador. “I don’t understand why he didn’t understand that...” said Sen. Al Franken (D-Minnesota) in a later exchange. Have an excellent night, everyone, I’m off to go get this incredible exchange implanted in a chip inside my brain.